Volcan or Boquete? A matter of personal choice. View of Vólcan Barú from my front room. Why not Volcan? a reader wanted to know. Why did I favor Boquete on this website? I was surprised, because I did not know I had done so. My only excuse: I had not yet had time to write much about Volcan and the surrounding countryside. Judging from local bulletin boards, rivalry between the two Chiriqui Province highland communities is high. But at the risk of getting shot down in flames by supporters of Boquete and by some residents of Volcan who would prefer to see their community stay out of a Boquete-style land rush, I suppose I should state my preferences and the reasons for them. I have voted with my feet: I live in Volcan. 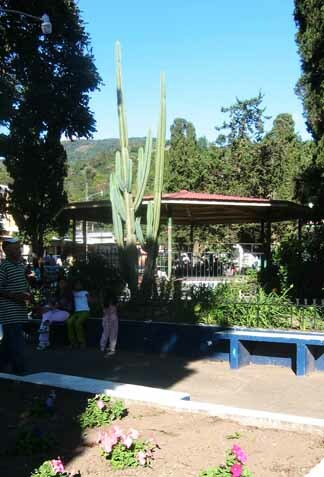 Bandstand in Boquete's colorful town square. As one contributor to a local bulletin board pointed out, Boquete has a town square and a Rotary Club. Those for whom that is important will no doubt prefer Boquete. Boquete has many upscale houses, several hundred gringos and canadianses, and a busy (and, to my mind, crowded) downtown area with several restaurants and small hotels. Volcan, on the other hand, has five supermarkets, two banks, several drug stores, at least two hardware stores, three service stations, a handful of restaurants and a couple of hotels scattered sleepily along about one mile of highway between David and Rio Sereno on the Costa Rica border about 20 km away. There is no town square. It's difficult, even, to pinpoint the town center. My adopted town is not a place of beauty – until you raise your eyes to the surrounding mountains, dominated by Volcán Barú. Volcan is about open spaces, Boquete sits in a bowl. The countryside outside both communities holds the beauty, in my opinion. The hills around Boquete offer some fantastic views, but much of the countryside approaching the town, land now selling for up to $60 a square meter, is flat, relatively treeless, and uninteresting. 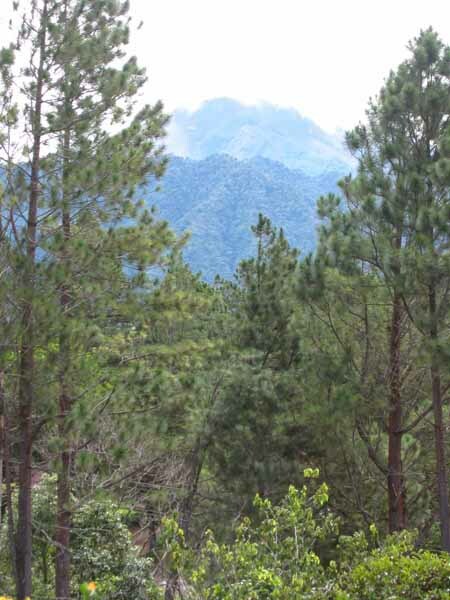 The country close to Volcan, the other side of the dormant Volcán Barú, which the highest point in Panama, is dominated by hills and small mountain peaks covered in trees. It is, to my way of thinking, more pastoral, more peaceful. The land is cheaper, but it's on the rise here, too, as North American retirees and investors move in. One dairy farmer told me he plans to sell, but he will wait five years. He thinks prices will multiply. Many fear that this will be the next Boquete in terms of land prices. Perhaps that makes it a good investment target. I just hope it is not spoiled in the process. Panama, with its many retirement enticements, is for sale as Americans cash in high-priced real estate in California, Florida, New York and elsewhere before the anticipated bust there. Some ex-pats have complained that Boquete is boring, that there is nothing to do. 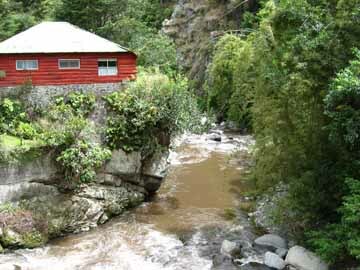 There is even less to do in Volcan for those who need external stimulation such as movie theatres and dancing. But I and many others like it that way. Boquete, in my opinion, has lost much of whatever Panamanian charm it might once have had, trampled under a tide of immigration. It is too touristy for my tastes. Some pensionados might prefer it that way. I like the fact that the only busyness around my place is created by the birds. My only complaint: the thunderstorms that frequently knock out my high speed wireless Internet connection. But sometimes the simple life and high tech don't quite mesh. That's one of the prices to be paid for tranquility in Volcan or anywhere else.